Amanda is a genius at getting one dog out through the gate, while the other ones stay still. When I attempt it, they all try and shove through at once so I’ve been working quite hard at improving the dogs’ “gate manners”. I’ll often open the gate and then quickly close it if they start to try and leave without me telling them they can. After a few repetitions they will all stand nicely and wait. Then the trick is to call the dog out that you want without everyone else breaking their stay. I’m still working on this part! But one of the other benefits I’ve noticed of the good gate manners is that the dogs get this very cute, expectant look on their face. So the other day I grabbed the camera and took a picture of Kalo while he was waiting patiently at the gate. And amazingly enough, no one escaped while I was taking the picture. We are taking orders for the 2009 Calendar. You can check out the different pages on our flickr site! We couldn’t fit everyone’s dog in the Calendar so we just picked the best photos. I’ve listed everyone who is in it below. Please let me know by October 10, 2008 if you’d like to order one. Just send us an e-mail at info@paws-on-the-run.ca. They’ll cost $18 and the proceeds will go to the Prairie Dog Canine Rescue. So even if your dog isn’t in the calendar, you can still have a fun calendar that helps out a good cause! 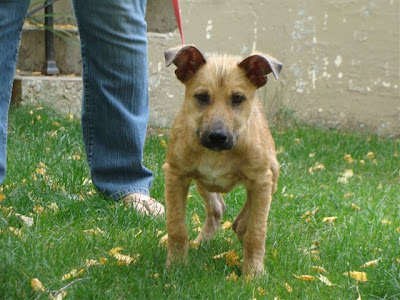 The rescue has one little guy in rescue right now who could really use the money – his name is Brian and he is the cutest little shepherd cross pup. He’s had a really hard time with life up until now! Just click on his name to find out more about his life. 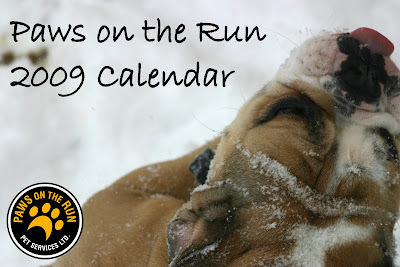 The dogs in the calendar are: Moxie, Amber, Atlas, Bruiser, Bella, Izzy, Dozer, Elvis, Jenna, Charlee, Guiness, Jackson, Jasper, Fenway, Brodie, Tawny, Aleyra, Oreo, Sheba, Tucker, Ruby, Perkins, Zoey, Chester, Levi, Abby, Barley, Charley, Paden, Zorro, Diva, Trouble, Harley, Barkley, Kalo, Fundy, Gus, Otus, Vesper, Pip, Daisy, Suka, Ellie May, Beacon, Logan, Tundra, Milo, Maggie B, Gus H, Brodie, Maui, Duke D, Izzy, Logan, Taylor, Neena, Lily, Vito, Maggie Mae, Cruz, Cheeko, Shelby, Harley, Willow, Hurly, Ivy, Jack and Kerry, Lindsay, Coco, Ruby, Mira, Molly, Rosie, Deja, and Trigger. …and even share it with a little friend. Even though the Zisc’s don’t last as long as the other toys, I think it is their favorite. Dogs really can have best friends. It isn’t that they won’t play with other dogs, but if their best friend is here, they seem to spend 90% of their play time with that one friend. However, most dogs seem to have a more varied “dance card” so to speak. Atlas and Duke, Ruby and Lacey, Suka and Ellie May, Kayla and Jack, Maggie Mae and Gus are just a few examples of best daycare buddies. Otus and Vesper are two more that have that special connection. So do you remember that big long e-mail I sent out a few weeks ago about all the upcoming changes (i.e. rate increase in December, closing the daycare on Saturdays, Lacey’s Birthday Sale, etc.)? If you managed to read the entire e-mail you would have noticed that there was going to be a Holiday Promotion in December. I promised that you would be able to enter to win a gift basket of goodies every time you brought your dog to daycare. Well some of those goodies arrived yesterday. Meet Rudy and Charlie, just two of the items you’ll find in the gift basket. Aren’t they cute? Sukhoi is a young puppy that started coming to daycare just last week. He is a Black Russian Terrier (If you are like me and have never heard of the breed, check out the link to find out more about them.). He is “little” now but will grow up to be around 30 inches tall! It will be fun to watch him grow-up. Hopefully when he is full grown, he’ll stop thinking he is a lap dog. We should have called the daycare “Dachshunds on the Run” because lately we’ve had a lot of them. They are even giving the labs a run for their money in terms of numbers! This little guy is Leo. He and his brother Zach have just started coming to daycare (Zach is the fuzzy white dog in the back of the photo). They are both a little older and a little mellower than most, but they enjoy the company of the other dogs, especially during nap time on the couch! 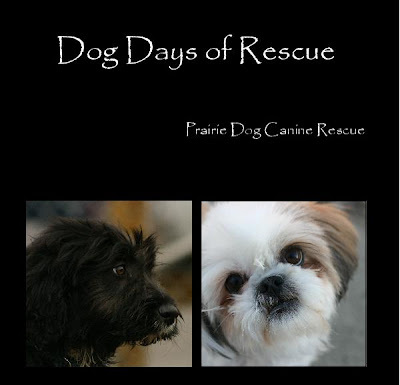 We are selling some books for the Prairie Dog Canine Rescue at the daycare. It is a beautiful collection of photos of rescued pups and inspirational dog quotes. You can buy a book for $30 at the daycare or order it on-line (if you are wondering why it is cheaper on-line it is because shipping is on top of that price…). As with all Prairie Dog Canine items, all proceeds will go directly to the rescue! We’ll miss your laughter, your stories, your inventive suggestions (if it was up to Sandy, we’d have a bone shaped pool in the backyard), your Starbucks deliveries and your company. Stop by and visit any time. And hey, if your pharmacist gig doesn’t work out, you know where you can find a job!